An iconic design, the ultimate sportyacht. Cutting edge style and a sleek profile. Engineered and built to the highest superyacht standards. A market leader with a cult following. Like a breath of fresh air in a sea of sameness, it offers a more dynamic lifestyle, yet relaxed and elegant. Large open decks that flow into sophisticated beach house interiors. In hulls with exceptional seakeeping even at speeds of 28-32knots. Iconic design, unrivaled since conception. Designed strategically as a family with a clear and unmistakable identity. From 120ft to 210ft. From Open Sportyacht to Trideck Sportyacht. Sportyachts built in aluminium with Superyacht build quality. All from an iconic brand with true pedigree. Time earned from 101 years of storied boatbuilding. Another chapter in a rich heritage of designing high performance Superyachts. The stainless steel strip running through the porthole is the signature styling element of the Classic Sport series. Distinctive curves that integrate the hull with the superstructure for a sporty, yet elegant look. The aft deck design that means you are closer to the sea. 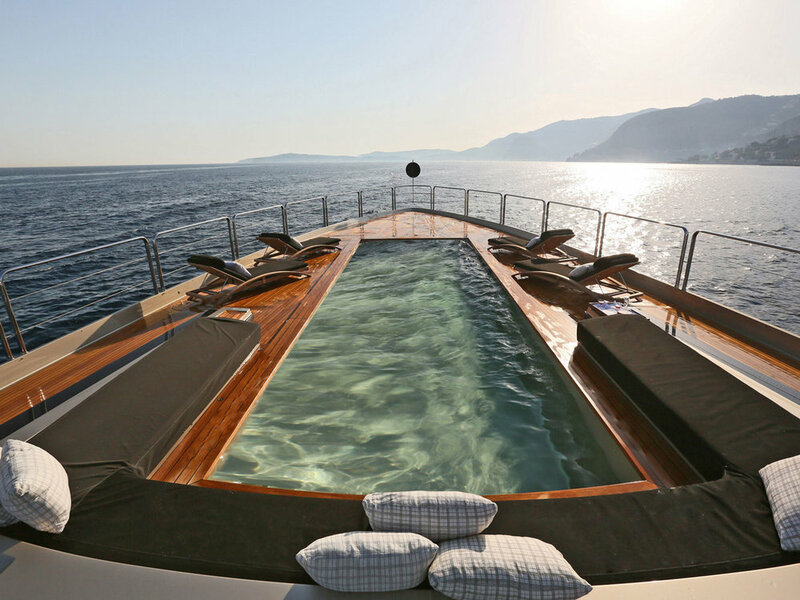 The aft deck is always one of the most enjoyed places by an owner on a superyacht. From the curved haunches, to the straight hard edges, every surface reminds us of the luxurious setting the Classic Sport portrays. The shaped glass on the PJ Classic Sports range is one of the main stylistic cues of the PJ brand. The tinted windows not only add to the slender profile of the vessel from a distance, but also create elegant passageways for the exterior. The uncompromising performance you would expect from Palmer Johnson yachts. Carefully considered and designed extra touches that set the Sportyacht series apart. One of the many signature features of the iconic 120 Sportyacht. 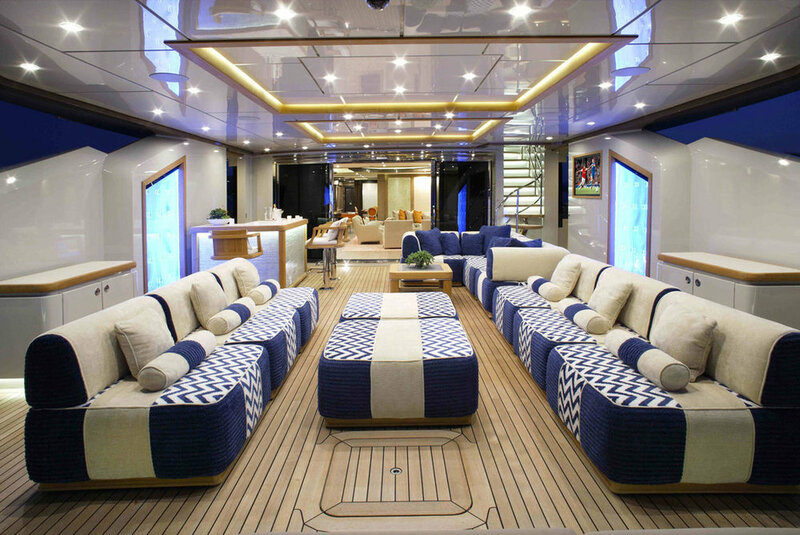 Styled to give a clean look to the aft deck and reveal to the privileged guests, the upper deck area. The PJ 120 and PJ 170 Classic Sport include in the top structure of the main deck an electrically deployed awning allowing for the owner and guests to relax and decide at the simple touch of a button if they would prefer to sit in the shade or enjoy the warmth of the sun. The 150 Classic Sport introduced this truly innovative feature to the Palmer Johnson Classic Sports range. It not only provides a comfortable seating area where guests can relax and admire the views, it is also ideally placed to provide these same views in the adjacent indoor dining area through the full height glass. The cleverly designed driving controls are positioned on either side of the yacht to facilitate docking. They allow the captain to be in the optimal position, whether berthing along side or in a very high stern to position.